Reaching Out To Montana's Jews, One by One Two young rabbinical students traveled in Montana for the past month, seeking to encourage other Jews in their faith. 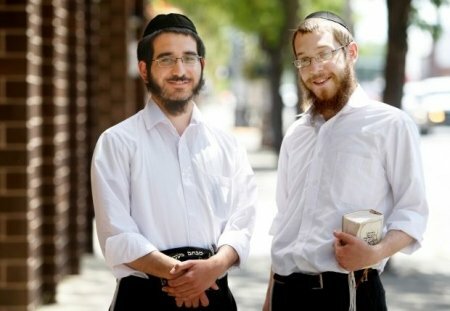 Rabbis Mendy Grossbaum, 23, and Mendel Misholovin, 24, are members of Chabad-Lubivitch, a branch of Orthodox Judaism, which has its headquarters in Brooklyn, N.Y.
Grossbaum is originally from Toronto, where his father serves as a rabbi and Chabad-Lubavitch representative. Grossbaum completed his rabbinic studies at the Rabbinical College of America, and then continued his studies at the central academy of the Chabad movement, in Brooklyn. Misholovin is from West Bloomfield, Mich., and he studied and received his rabbinic ordination at the academy. A tenet of the movement, which has its roots in 1700 in Lithuania, is to care for the spiritual and material needs of Jews everywhere. As part of that, rabbis do summer outreach, to teach and encourage individuals they meet. This year, 350 of the rabbinical students have been sent out to Jewish communities in the United States, Asia, Europe and elsewhere. Dubbed “The Roving Rabbis,” the community outreach program started in the 1940s by Rabbi Menachem M. Schneerson, revered leader of the group. Since then, students have visited more than 100 countries around the world. Montana outreach has gotten less difficult since Rabbi Chaim Brukand his wife, Chavie, opened a permanent Chabad-Lubavitch Center in Bozeman in 2007. Getting guidance from Bruk “makes it so much easier,” Grossbaum said, sitting on a couch in the Crowne Plaza lobby in downtown Billings, next to a Starbucks coffee shop. The small Jewish communities in Montana are often tight-knit, Grossbaum said, which makes it easy to get to meet them all. The pair landed in Bozeman on July 4 and have been traveling since, he said, wearing a white long-sleeve dress shirt, dark slacks and a yarmulke — or skullcap — on his head. He and Misholovin plan to stay about another week. Then both will head back to New York for additional studies. The pair initially drove from Bozeman to Billings, then went on to Butte, Great Falls, Lewistown, Helena and Dillon. They intended to head back to Bozeman on Thursday for Shabbat, or the Sabbath, which commences at sundown on Friday. At a time in the past, Misholovin said, rabbis used to sit at home and people would come to them with questions or to learn something new. A visit might last from five to 90 minutes, depending on the response. One of the main goals during that time, he said, is to encourage those they meet to do mitzvah, to follow God’s commandments. This summer the pair is especially focusing on encouraging those they encounter to pray, using tefillin (small leather boxes with scripture inside) strapped to their left arm and their head. “This is about binding our hearts and minds and focusing them for the service of God and the protection for our brethren in Israel,” Misholovin said. In bigger cities, they might meet with 10 or 15 men or women in a day, while in smaller towns, it can be four to six, or less, Grossbaum said. When the pair traveled to Valier, they stopped to visit the lone Jew in the small northwestern Montana town. Grossbaum and Misholovin are focused on Jews, but they welcome questions from others. Some wonder, with their choice of clothing, whether the rabbinical students are Mormon missionaries. “Usually the question we get is ‘What are you guys doing here?’ ” Grossbaum said. They are glad to spread the message to Jews and non-Jews alike about making the world a more godly, spiritual place.